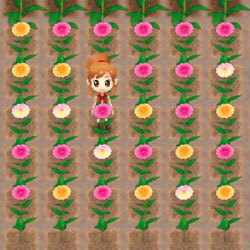 If you get bored with growing crops, you may also grow pretty flowers on your farm. Flower seeds can be purchased from Iris' flower stand in town. She is open Monday through Friday from 10:00 am to 6:00 pm. Flowers can be grown any time of the year, but they can become GREAT quality during preferred seasons. Many of the flowers can also mutate into new color variations during the plant's preferred season. Tulip, Dahlia, Cosmos, Carnation, and Pansy can change colors. If you sell enough of the color variant to Sam or ship them via your shipping bin, the seeds for that color variation will appear for sale in Iris' shop. You will need to raise your friendship to 1 Music Note before she will sell Tulip seeds. Flowers don't require any extra fertilizer or weather requirements to mutate. All you have to do is plant them during the right season and then wait until they mature. Their mutations are much simpler to trigger than with crops. There are 40 flowers that you can discover in the game: 20 of the normal type and then 20 GREAT versions. The Flowers Discovered in your Encyclopedia will keep track of the number of flowers you've unlocked. Note that currently in the iOS version of the game, the Flowers Discovered value is bugged and may reset back to 1 for unknown reasons. Marguerite and Tulip can be found growing wild in the mountain area outside of your farm, but they will not be found in GREAT quality. You'll need to grow them during Spring to discover the GREAT variations.